Happy Faces Preschool and childcare is a fun, dynamic, nurturing, educational and HAPPY place to learn and play. 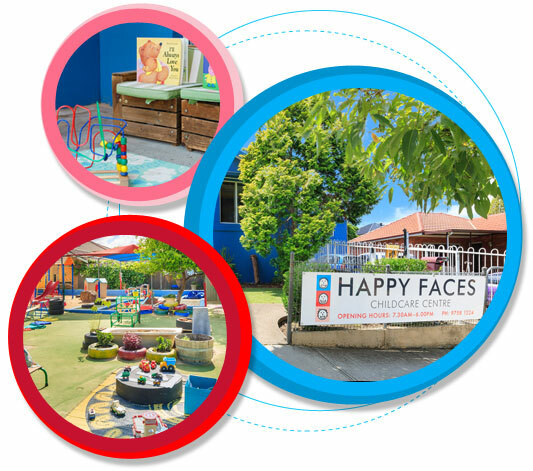 Happy Faces is open Monday – Friday, 50 weeks per year, excluding weekends and Public Holidays from 7:30am to 6pm. We cater for 39 children daily aged 2-5 years. Happy Faces has been rated as an EXCEEDING service by the Department of Education and Care Services in all 7 Quality areas. Nutritious home cooked meals prepared in our kitchen and served with lots of love by our resident cook , Miss Mandy. Halal food is also provided. Fully qualified Early Childhood Teachers and Diploma trained educators in all rooms. Curriculum teaching and learning programs across all three age groups. · Excellent school readiness programs taught by Early Childhood Teachers. At Happy Faces we meet regularly with local schools to work in partnership to ensure a successful transition for children. Safe, secure outdoor learning playground with Learning Centres. An accredited Sun Safe centre by the Cancer Council. “Family” events across the year including outdoor movie nights, Discos, family afternoons at play centres, BBQs in the park and market nights. Happy Faces prides itself on building wonderful partnerships with families in order to create a wonderful community of HAPPY and confident learners.